No Catholic who takes the salvation of his immortal soul seriously can ignore the intercessory power of Saint Anthony of Padua. Over and above all of the little things we ask Saint Anthony to find after we have lost them, Saint Anthony of Padua, an exemplary preacher of the truths of the Catholic Faith, must be invoked today in our times under one of his most important titles, "The Hammer of Heretics." We need Saint Anthony's help right now in the midst of the difficulties within Holy Mother Church so that each of us will be fortified by our hidden time in prayer before the Blessed Sacrament and our unabashed expressions of love for the Holy Name of Mary to proclaim the truths of the true Faith openly in the midst of the heretics in the counterfeit church of conciliarism who want to convince us that everything about the Catholic Church prior to the death of Pope Pius XII on October 9, 1958, must be rejected and vilified and apologized for. Although Saint Anthony is a saint for all days and for all ages, he is particularly apt to help Holy Mother Church in these our days, rife as they are with all of the synthesized heresies that have amalgamated themselves under the aegis of Modernism. Thirteen years the junior of Saint Francis of Assisi, Fernando Bulhom (or Bouillon) was born, as some accounts report, the son of Martin and Theresa Bulhom (or Bouillon) in Lisbon at a time, in 1195, when that great, proud capital of Portugal was under the control of Spain. Young Fernando joined the Canons Regular of Saint Augustine at the age of fifteen, leaving them at the age of twenty-six to join the Franciscans, having been inspired by the example of the Franciscan Protomartyrs (Saints Berard, Peter, Otho, Accursius and Adjutus) who were beheaded in Morocco in the year 1220. Fernando had seen the bodies of these great martyrs at the Church of Santa Croce in Coimbra shortly after their martyrdom at the hands of that peace-loving group known as Mohammedans. Fernando took the name of Anthony once he joined the Order of Friars Minor, where he lived and prayed and served so valorously until his death ten years later at the age of thirty-six. Saint Anthony, who had distinguished himself in the Augustinian order, did not realize his desire to die a martyr's death at the hands of the adherents of George Walker Bush's and Barack Hussein Obama/Barry Soetoro's "religion of peace" that the conciliar "popes" have hailed as a "great monotheistic religion." A shipwreck in 1221 en route back to Portugal from Morocco, where he had taken seriously ill, placed Saint Anthony on the shores of Sicily. He went from there to try to get himself to the Third General Chapter of the Franciscans, being noticed by no one as the other Franciscans were receiving their various assignments. The learned and holy Saint Anthony was taken in by Father Graziano, the Provincial of Coimbra, who brought him to Monte Paolo, near Bologna, whereafter he was ordained to the priesthood to offer Holy Mass for the lay Franciscans. It was there that he was called upon to preach in the absence of any other priest who was prepared to do so during an ordination Mass. It was from that point on that his fame as a preacher and teacher and worker of miracles spread throughout Europe. Saint Anthony accepted his assignment as a professor, teaching at the University of Bologna and at the University of Toulouse, inspiring his students to spend time before the Blessed Sacrament in prayer and to proclaim the Holy Name of Mary when faced with difficult situations and persons. He was unafraid to proclaim the fullness of the Faith in whatever circumstances he found himself, sparing neither the lowly nor those of great station in the Church and in the world. To wit, Saint Anthony once began a sermon at a synod in Bourges, France, reproving Archbishop Simon de Sully as follows: "You, the mitred one! It is about you I shall be preaching now." The archbishop repented of his errors and reformed. No, not even bishops were immune from his efforts to call men to absolute, unwavering fidelity to the Deposit of Faith and to the faithful fulfillment of their duties to oppose error without any ambiguity and without any hint of compromise with said error. Saint Anthony was a lover of the poor. He pleaded with creditors to forgive the debts of their debtors. He preached against usury, which is one of the very foundations of contemporary commerical and economic life. And it was his tireless efforts that saw the municipality of Padua pass laws in 1231, shortly before his own death, that favored the cause of debtors who could not pay off their debts. He preached with great fire near the end of his life about the necessity of ending enmities and hatreds, thus effecting the reconciliation of countless thousands of estranged people to each other. Is it any wonder that the Christ Child, Who lived in poverty and Whose Sacred Heart is the repository of His Divine Mercy, appeared to Saint Anthony to smother his face with kisses? The holiness of Saint Anthony was evidenced by the many miracles he performed during his own life, to say nothing of the countless miracles that have taken place in the nearly eight centuries since his death in the year 1231. He bi-located while giving a sermon. His mere blessing made poisonous food designed to kill him totally harmless. A horse (or donkey) that had refused to eat for three days knelt before the Blessed Sacrament when It was brought to him by Saint Anthony by unbelievers who did not believe in the Real Presence of Our Lord in the Eucharist.. Schools of fishes gathered to hear him when his words had been rejected by hardened heretics. Indeed, time simply does not permit the recounting of so many other documented miracles that took place during Saint Anthony's life. The most important miracles wrought by Saint Anthony during his lifetime and that are still being wrought by his intercessory power from Heaven, however, involve the conversion of souls away from sin to scale the heights of personal sanctity as members of the One, Holy, Catholic and Apostolic Church founded by Our Lord upon the Rock of Peter, the Pope. Saint Anthony, a true Wonderworker (or Thaumaturgist), is working wonders yet in the Church and the world today. We can fly to him in total confidence, not only in times when we are in need of finding some lost object but especially in times when our faith begins to falter and when we seem to lose our way on the rocky road that leads to the Narrow Gate of Life Himself. Ferdinand de Bullones, afterwards called Anthony, was born of decent parents at Lisbon in Portugal, on the Feast of the Assumption, in the year of grace 1195. They gave him a godly training, and while he was still a young man, he joined an Institute of Canons Regular. However, when the bodies of the five holy martyred Friars Minor, who had just suffered in Morocco for Christ's sake, were brought to Coimbra, the desire to be himself a martyr took a strong hold upon him, and in 1220 he left the Canons Regular and became a Franciscan. The same yearning led him to attempt to go among the Saracens, but he fell sick on the way, and, being obliged to turn back, the ship in which he had embarked for Spain was driven by stress of weather to Sicily. From Sicily he came to Assisi to attend the General Chapter of his Order, and thence withdrew himself to the Hermitage of Monte Paolo near Bologna, where he gave himself up for a long while to consideration of the things of God, to fastings, and to watchings. Being afterwards ordained Priest and sent to preach the Gospel, his wisdom and fluency were very marked, and drew on him such admiration of men, that the Pope, once hearing him preach, called him The Ark of the Covenant. One of his chief points was to expend all his strength in attacking heresies, whence he gained the name of the Heretics' everlasting Hammer. O glorious Anthony, the simplicity of thine innocent soul made thee a docile instrument in the hand of the Spirit of love. The Seraphic Doctor, St. Bonaventure, hymning thy praises, takes for his first theme thy childlike spirit, and for his second thy wisdom which flowed therefrom. Wise indeed was thou, O Anthony, for, from thy tenderest years, thou wast in earnest pursuit of divine Wisdom; and wishing to have her alone for thy portion, thou didst hasten to shelter they love in some cloister, to hide thee in the secret of God's face, the better to enjoy her chaste delights. Silence and obscurity in her sweet company was thine heart's one ambition; and even here below her hands were pleased to adorn thee with incomparable splendour. She walked before thee; and blithely didst thou follow, for her own sake alone, without suspecting how all other good things were to become thine in her company. Happy a childlike spirit such as thine, to which are ever reserved, the more lavish favours of eternal Wisdom! Popular devotion to Saint Anthony is one of the things that unites Catholics of all stripes in these times of massive confusion and disarray. 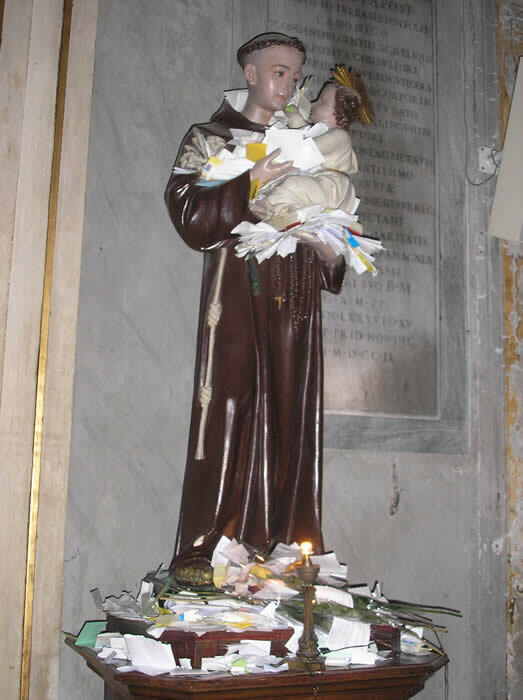 Thousands of slips of paper, containing on them the prayer intentions of Catholics beseeching our dear wonder worker in Heaven, Saint Anthony, adorn his statue in the great church of Santa Maria in Trastevere in Rome, Italy. (See picture below.) We must spread devotion to Saint Anthony, beseeching him most of all to help us to find our way home to Heaven in these times of doctrinal and liturgical shipwreck that have devastated so many souls. It is no accident that Our Lady appeared to Francisco and Jacinta Marto and Lucia dos Santos on June 13, 1917, the 686th anniversary of the death of the illustrious son of Portugal, Saint Anthony. Saint Anthony loved the Mother of God. Her intercession from Heaven had helped to keep the land of his birth safe during times of peril and corruption. He would join in those prayers from Heaven upon his death on June 13, 1231. How wonderful it is that Our Lady told Lucia on this very day, June 13, that she was to stay on earth and to suffer much, telling her that "Jesus wants to make me known and loved. He wishes to establish devotion to my Immaculate Heart in the world. I promise salvation to those who practice this devotion. Those souls will be loved by God like flowers arranged by me to decorate His throne." She then went on to tell Lucia, "My Immaculate Heart will be your refuge and the road that will lead you to Heaven." Saint Anthony's heart must beat with special joy in knowing that the date of his own birth unto eternal life was chosen by Our Lady to ask his fellow native of Portugal to spread devotion to the Immaculate Heart of Mary, to whose Holy Name he was so devoted and invoked so fearlessly in the midst of difficulties and controversies. It should be remembered that Our Lady appeared to Saint Anthony to console him when a line he had read in the Divine Office disturbed his peace about her bodily Assumption into Heaven, assuring him that she had indeed been assumed body and soul into Heaven. How fitting that Our Lady, who had appeared to Saint Anthony in his lifetime, would appear to Jacinta, Francisco, and Lucia for a second time on this date, the date of his own entrance into eternal life! Ecce Crucem Domine, Behold the Cross of the Lord! Fugite, partes adversae, Flee ye adversaries! Radix David, alleluia. The Root of David has conquered, alleluia! Saint Anthony lived only thirty-six years on this earth. He lived fifteen at home with his parents, ten with the Augustinians, and eleven with the Franciscans. It is not the longevity of our lives that matters but how we use our time to follow Our Lord as members of His true Church and imitating the virtues of all of the saints, starting with the Queen of Heaven and earth herself, Our Blessed Mother. Saint Anthony did a lot in a short amount of time. Imagine how slothful we must appear to him as we waste our time on various diversions that have nothing at all to do with the salvation of our immortal souls. Imagine how much he, as a lover of Our Lady and as one who lived at the same time as Saint Dominic de Guzman and Saint Francis of Assisi, want us to pray at least one set of mysteries of her Most Holy Rosary each and every day without fail. Honoring Saint Anthony of Padua on this great feast day and remembering as well the second apparition of Our Lady in the Cova da Iria in his native country, may we give public expression to our confidence in Saint Anthony, a son of Mary and a son of Saint Francis, in our desire to embrace all of the virtues, especially holy poverty, so that we might be rich unto eternity in an unending Easter Sunday of glory in Paradise. Our Lady, Ark of the New Covenant, pray for us. Saint John the Baptist pray for us. Saint Anthony, who was once called by Pope Gregory IX the "Ark of the Covenant," pray for us to imitate your virtues and to regain by penance what we have lost by sin and hard-heartedness. Saint Bonaventure, chronicler of the life of Saint Anthony, pray for us. Saint Dominic de Guzman,, pray for us. Saint Anthony, glory of the Friars Minor, pray for us. Saint Anthony, ark of the testament, pray for us. Saint Anthony, sanctuary of heavenly wisdom, pray for us. Saint Anthony, destroyer of worldly vanity, pray for us. Saint Anthony, conqueror of impurity, pray for us. Saint Anthony, example of humility, pray for us. Saint Anthony, lover of the Cross, pray for us. Saint Anthony, martyr of desire, pray for us. Saint Anthony, generator of charity, pray for us. Saint Anthony, zealous for justice, pray for us. Saint Anthony, terror of infidels, pray for us. Saint Anthony, model of perfection, pray for us. Saint Anthony, consoler of the afflicted, pray for us. Saint Anthony, restorer of lost things, pray for us. Saint Anthony, defender of innocence, pray for us. Saint Anthony, liberator of prisoners, pray for us. Saint Anthony, guide of pilgrims, pray for us. Saint Anthony, restorer of health, pray for us. Saint Anthony, performer of miracles, pray for us. Saint Anthony, restorer of speech to the mute, pray for us. Saint Anthony, restorer of hearing to the deaf, pray for us. Saint Anthony, restorer of sight to the blind, pray for us. Saint Anthony, disperser of devils, pray for us. Saint Anthony, reviver of the dead pray for us. Saint Anthony, tamer of tyrants, pray for us. O my God, may the pious commemoration of Saint Anthony, Thy Confessor and Proctor, give joy to Thy Church, that she may ever be fortified with your spiritual assistance and merit to attain everlasting joy. Through Christ our Lord. Amen. If then you ask for miracles, Death, error, all calamities, Leprosy and demons fly, And health succeeds infirmities. The sea obeys and fetters break, And lifeless limbs you do restore; While treasures lost are found again, When young and old your aid implore. All dangers vanish at your prayer, And direst need does quickly flee; Let those who know your power proclaim. Let Paduans say: these are yours. To Father, Son, may glory be And Holy Ghost, eternally. Pray for us Blessed Anthony. Make us worthy of the promises of Christ. Remember, O thou miracle-working Saint, that it never was heard that thou hast left without help or relief anyone who in his need had recourse to thee. Animated with the most lively confidence, nay, even with full conviction of not being refused, I fly for refuge to thee, O most favoured and blessed friend of the Infant Jesus! O eloquent preacher of the Divine mercies, despise not my supplications, but, bringing them before the Throne of God, strengthen them by thine intercession, and obtain for me what I ask - help and consolation in my need, O most glorious miracle-working St. Anthony. Amen. The Statue of Saint Anthony in the Church of Santa Maria in Trastevere in Rome, taken by Sharon Droleskey on Saturday, May 21, 2005.